We start with the usual Mis en Place and get ourselves organized. 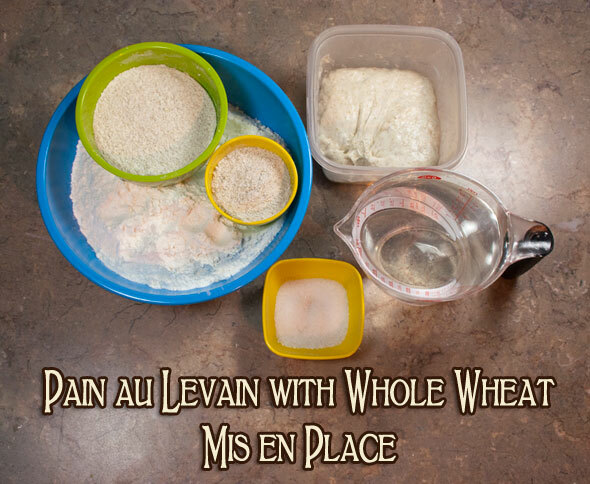 As noted: bread flour, whole wheat and a little rye flour, stiff starter, water and salt. The three flours and water are first mixed; note that I’ve held back about 50Ml of the water as I’d found that the flour had absorbed a fair bit of humidity and had come out rather wet before. 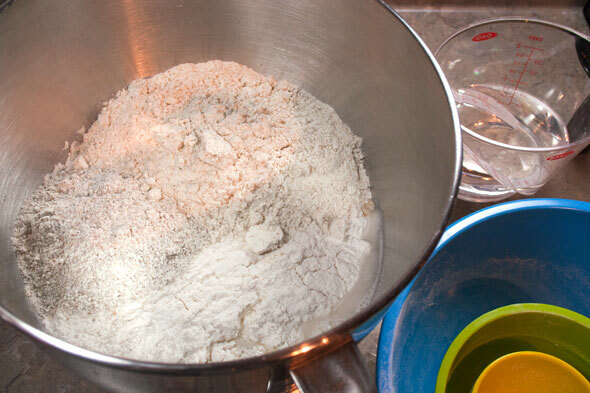 The salt and stiff starter are also held back. 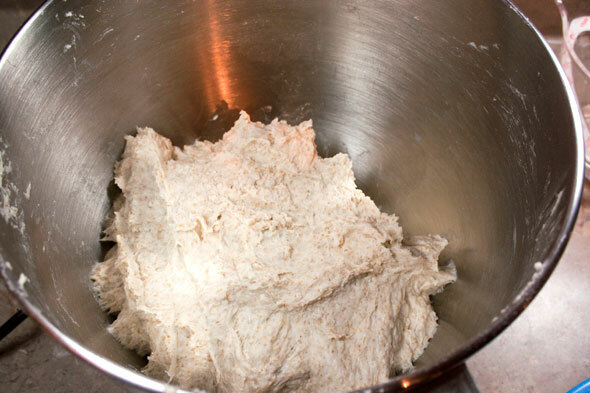 Once the flour was mixed to a shaggy texture, it is left to autolyse for 20 – 60 minutes; I went 60 this time around since I started the bread quite early in the morning and had time to spare. 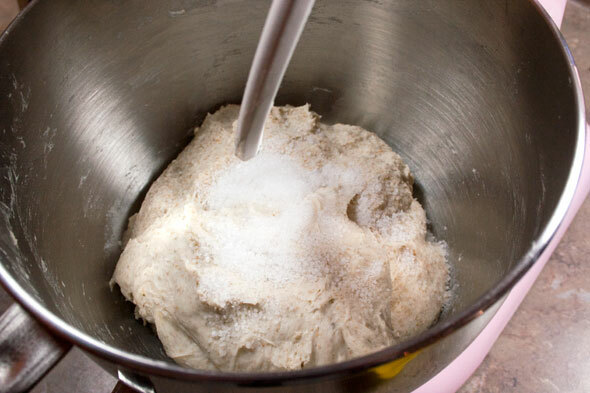 While kneading, I found the dough was a tad dry after all so I added about 2 teaspoons of water which got the dough to display the “kneading foot” where it stuck just at the bottom of the bowl. 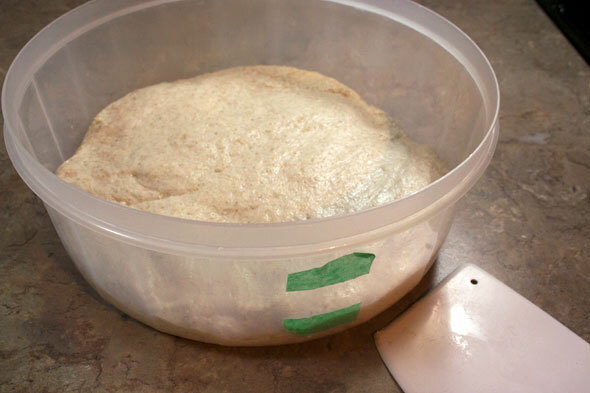 With the kneading finished, the dough is placed into the plastic oiled bowl and bulk proofed with two Stretch and Folds at 50 minute intervals. Total bulk proofing time: 2.5 hours. 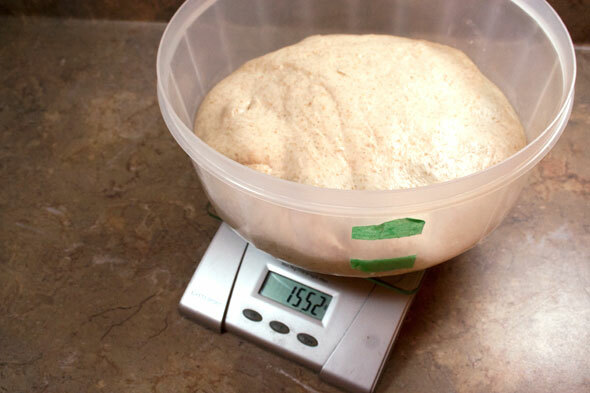 Once done, the dough is weighed and divided into three portions of 495 grams. 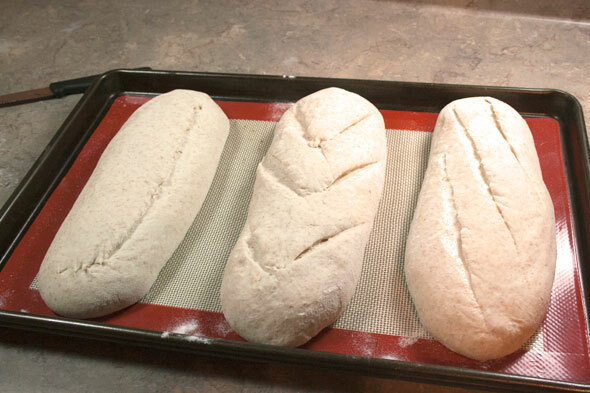 The three parts are then shaped into regular loaves this time. 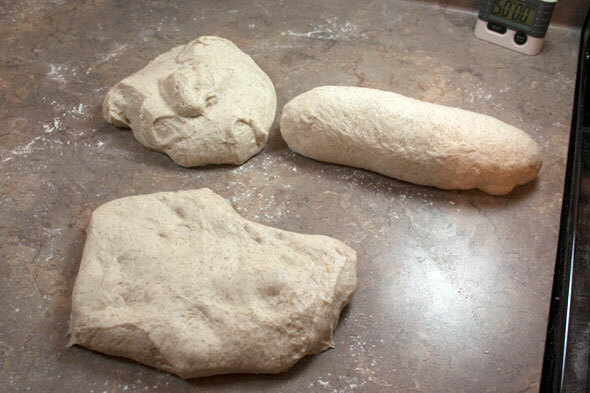 Once formed, the dough is placed in the couche and allowed to do the final proof for 2 – 2.5 hours. I checked them at 2 hours, gave the poke test and decided to let them go the full 2.5 hours. 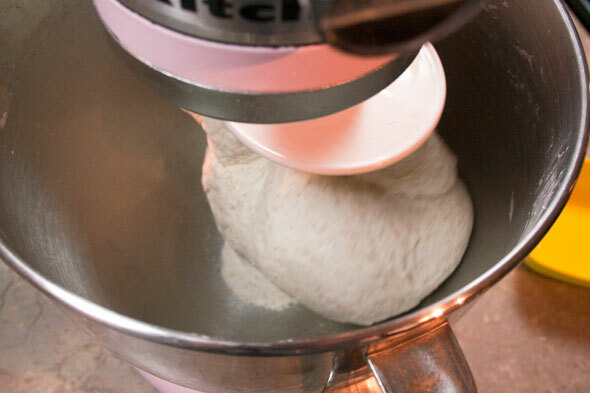 At that point, the dough is transferred to the lined baking pan and slashed. While doing this I tossed a cup of hot water into the 440ºF oven to build up the steam. 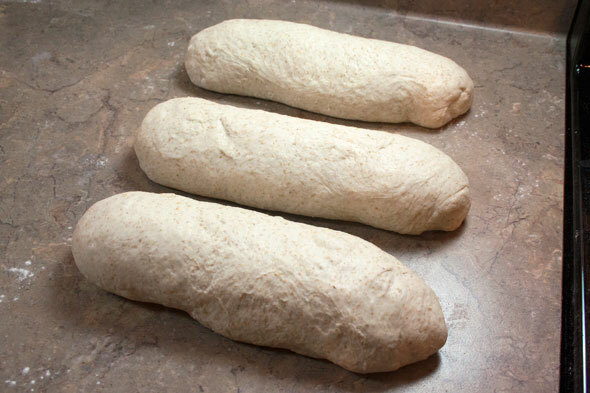 Unfortunately, I did get a little too rushed here and didn’t slash the loaves quite deep enough. Into the oven they went anyway, along with another cup of water. Fourty minutes later, the loaves came out of the oven, a nice deep golden colour (a bit darker than they seem in this photo) and allowed to cool for 30-40 minutes. … and later, I got the Crumb shot too. The verdict? Very nice again! Although the too timid slashing caused the bread to not expand as much as it likely could have (and get a bit of bursting on the bottom which you can sort of see in the slice above), this bread came out pretty nice. Better slashing need more determined action!! Must remember this. Flavour of this one is a little more nutty than the previous Mixed Starter version. The crust came out somewhat thin but still with a little chew and a good taste. 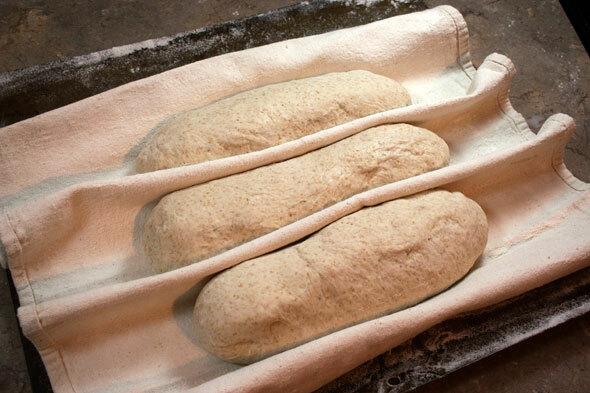 No overly done bottom this time – placing the laoves on double pans has helped eliminate the too-hot bottom issue. 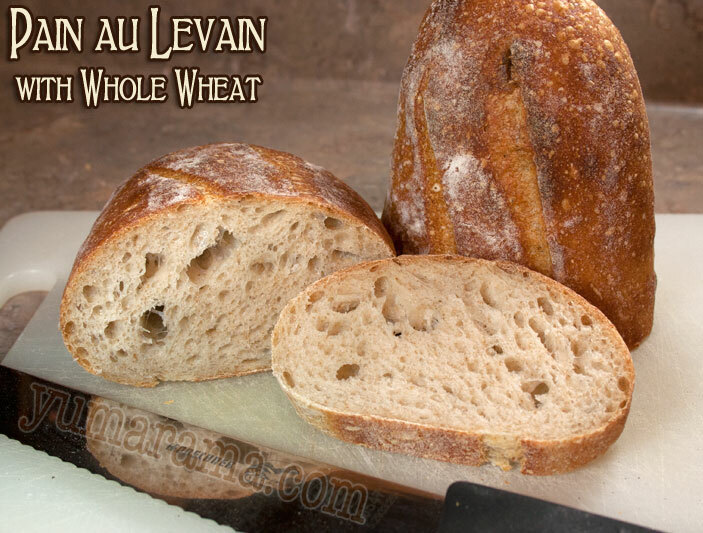 The sourdough brings along a nice flavour without making the bread ‘sour’; the slight sweetness of the whole wheat and rye still add a subtle tone. So which of the three varieties wins? Frankly, none and all of them. Although they have decidedly notable flavour differences, I can’t say one was “better” then the next. Different, a bit, yes. But they were all very good. Since they basically all followed the same process, that part of it didn’t make any of them easier or harder to make. The Mixed Starter did need two starters made up but that might have taken two more minutes to mix the rye up, hardly a deal breaker. 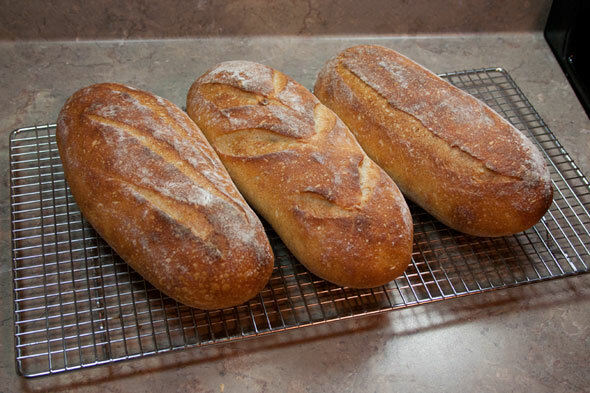 This set of breads has proven to be very enjoyable and the fact I’ve been able to knock out a few issues with the stove and ‘humid” flour was rewarding. These would decidedly go into the “make Again” pile. 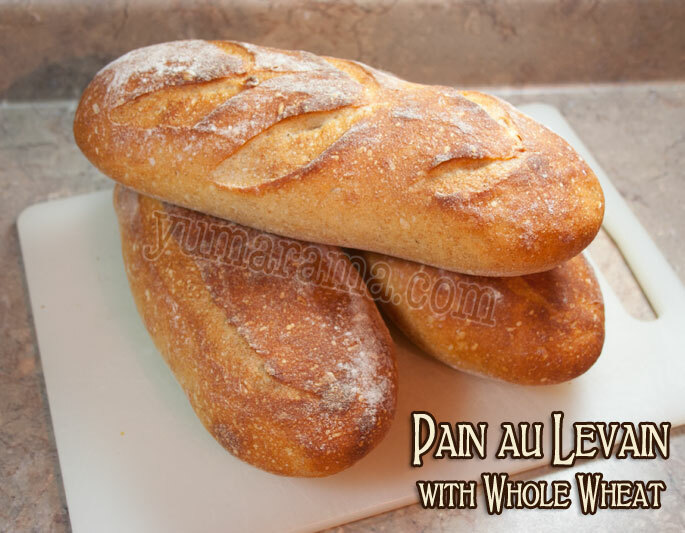 Check out other Mellow Bakers making these pains au Levain here! Never heard of it referred to as the ‘kneading foot’ before. I love that I always learn something new when reading your posts. Good job for successfully completing all 3 breads!! Lovely loaves. You have a lot of eating to do now! Well, I should point out that isn’t an “official” term that I know of, so don’t expect anyone else to know what it means. I was also thinking of “snail’s foot” but the imagery wan’t exactly great on that one. I’ve given away two of the loaves to people at work now so I’m cutting down on the personal consumption side. 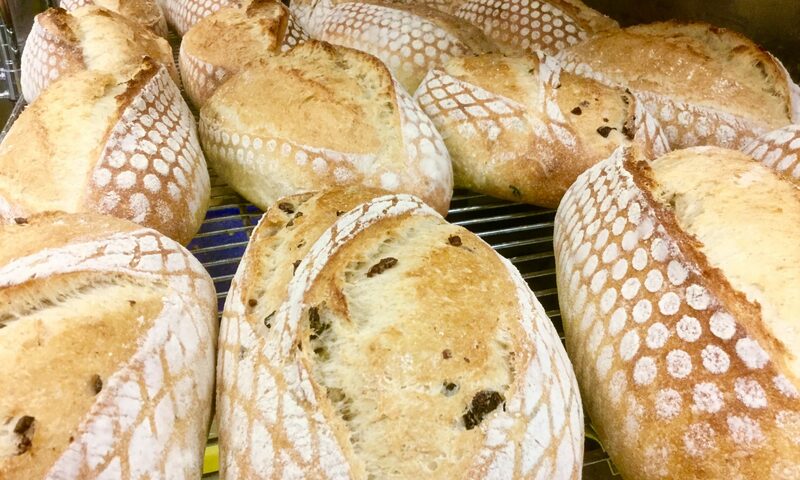 And they’re pretty small loaves at just 500g each. I think I’ll switch back to two 750g loaves next time since the slices one gets from these little loaves really are rather tiny.